Courtesy of Keller Williams Realty Rivertown, Clinton W Maki. VIEW THAT 3-D TOUR! – This quality, custom- built (single owner) LOG HOME is peaceful, relaxing, quiet and impressive. 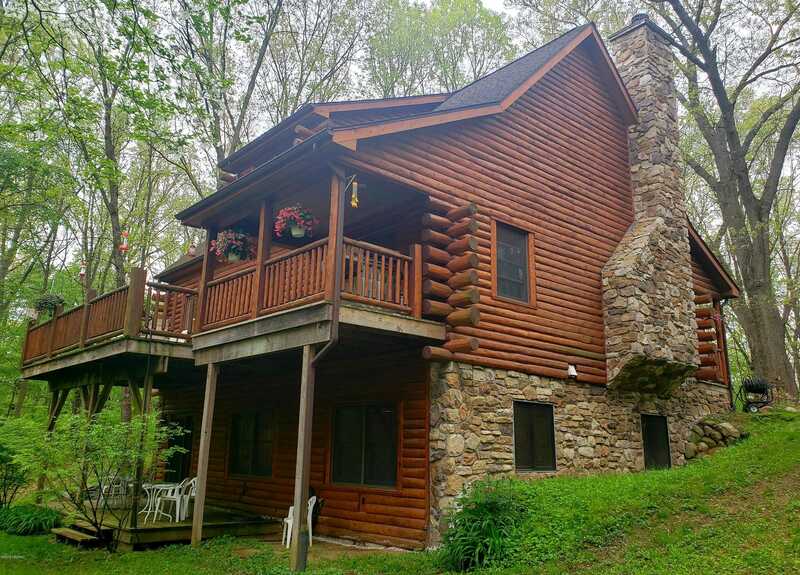 This iconic stone and log home is nestled on 2 wooded acres, overlooking Noah Lake. Executive features include incredible wood walls, STONE FIREPLACE , 3/4 inch oak flooring, and cathedral ceilings in the great room. Main-level deck with incredible view spans the entire back length of home, with 2 sliding glass doors for access to views and outdoors. Kitchen boasts hickory solid cabinets and all new stainless appliances. The walk-out lower level is completely finished and could be used for mother-in-law quarters, or college students. A/C, propane, and wood fireplace. Well water, and septic. Room for storage barn for the extra toys! Fourth bedroom comments: Daylight ANSI Spec.